Tool for creating Poser body part morph targets from C4D figures. This tool is part of the CR2 Loader package. Export Morphs is a utility designed to export new morphs to Poser readable squeezed morph files. Squeezed morph files consist only of the point definitions, and as such can not be loaded as geometry. These are the generally acceptable (and copyright infringement avoiding) method to distribute morphs to be used with someone elses mesh. Previously, you had to spend a lot of careful time with a text editor cleaning up the .obj morph files. These files are readable by Poser 4, ProPack and Poser 5. The Export Morphs utility is simple to use, yet powerful. It combines several of our previous morph utilities into one tool. This tool is designed to be used with either our Morph Tag system (necessary for loading models with lots of morphs into Cinema 4D) or the Mocca style Polygon Object style of morphs. It is coded to work with both. It has four main modes of operation. All modes are invoked by selecting an item in the object manager, and then running Export Morph to .OBJ which will be either in the Plugins menu, or in a Greenbriar Utilities folder in the Plugins menu, depending on how many of our tools you have installed. The different modes are called by what type of object is selected. 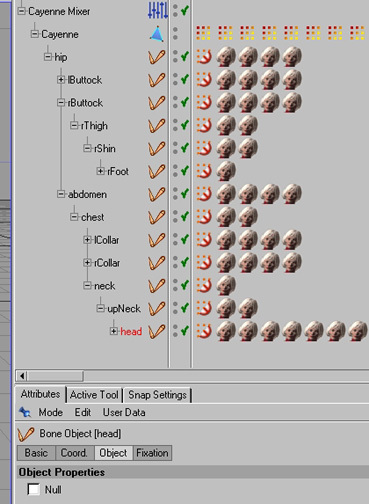 Mode one, the simplest mode for morph tags, is to select a morph tag attched to a body part (bone) and run the plugin. This will write a single output .obj file named bone.morphname.obj. 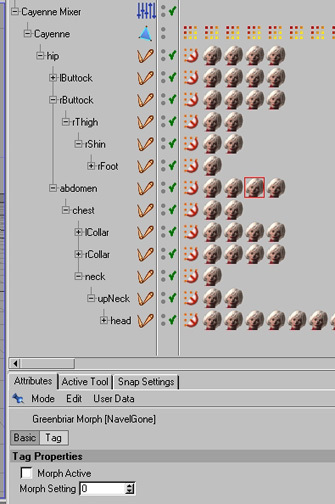 But if you select a morph tag that is attached to the main figure object (a body level morph) you engage mode two which will create an output file for each bone (body part) that the morph affects. In other words it will break a body level morph into the separate pieces that can be loaded into Poser. Each piece will also be named bone.morphname.obj, bone being the body part they have to load into in Poser. Modes one and two cover taking a single morph and writing it out into the one or more parts that are needed as morph targets for Poser. Mode three handles the situation where you want to write out a whole set for a body part (like the head). Mode three is engaged by selecting a Bone instead of a tag and then running Export Morph to .OBJ. 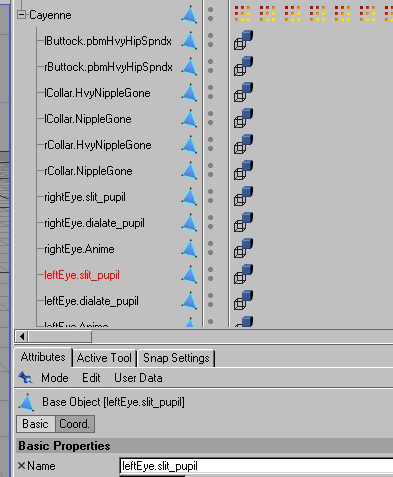 This will create an output object file for each morph tag attached to the bone. This is the same as running each morph one at a time, just handier. Mode four is the export of morphs that are polygon children of the main figure (Mocca style morphs).If you select a Polygon (point only or full polygons) and run the tool, it will treat it as a body morph and write out an .obj file for each body part that the morph affects (since it cant tell what it really applies to).